Ultimate guide to the best aquarium filters in 2018: Keeping an aquarium is a rewarding and even relaxing hobby. There is nothing like watching fish glide by a nicely decorated aquatic wonderland. For this reason aquariums have been popular since the 1960’s. Aquarium hobbyist get to enjoy the beauty that comes along with tank ownership but let’s not kid ourselves there is a lot of work that comes with owning and maintaining a healthy aquarium. In keeping a healthy aquarium where the inhabitants can thrive and live their best life in captivity, the most important aquarium accessory is your filtration system. Without the right aquarium filter your beautiful oasis can quickly turn into a smelly, bacteria filled nightmare with regular casualties. Nobody wants those kind of results so it would be smart to invest in the absolute best aquarium filter for your individual set of circumstances. In this guide we have covered the best aquarium filters for a variety of different circumstances. Feel free to use the following list to jump to what closely resembles your situation or continue reading for an overview of fish tank filter functions and what makes a filter adequate or inadequate. To start this section off, let’s answer this question: What is an aquarium filter supposed to do? A fish tank filter should ultimately make your aquarium a healthy environment for your fish and plant life. The best aquarium filters will accomplish this by performing a few different types of filtration. Biological filtration: The bio filter function is very important because it utilizes the natural Nitrogen Cycle to help break down the ammonia and harmful nitrites from the aquarium. What is interesting is that you can’t see any of this happening, think of biological filtration as the behind the scenes cleaning of your tank. Mechanical filtration: is the stuff you see, is your water cloudy and full of particles? Then you don’t have adequate mechanical filtration. Filter floss and filter sponges play huge roles in this area of aquarium filtration. Floating debris and visible waste even algae blooms floating in the water can be alleviated through a good mechanical filtration system. Last but not least chemical filtration: if you fill your aquarium up with water from the bathroom or the spicket in your front yard the water will no doubt include some hard metals or other influences that might be harmful to your fish. Most of us use SeaChem prime or other water conditioners to remove these types of harmful substances, however a filter equipped with a chemical filtration mechanism will assist in making your aquarium thrive. The easiest way to add solid chemical filtration is to use activated carbon in your filter. Just about every filter can accept carbon either in the form of a [easyazon_link identifier=”B002X6F7AW” locale=”US” tag=”flowerhorn0b-20″]filter media bag[/easyazon_link], basket or filter cartridge. During the process of selecting a filter for your aquarium you’ll notice a wide range of prices and styles of filters. Let me tell you that we’ve personally bought about 80 to 90% of the different brands on the market and all filters are not created equal by any means. There are a lot of duds out there that might seem attractive because of the initial price point but either lackluster performance or worse failure make them either bad buys or even disasters. In the content below you’ll get basic product information and some personal experiences with many of the filters. Take this information and consider it alongside your budget and reviews from other sources to make an educated decision to ultimately the get best filter for your fish tank. Self-priming - starts up automatically after cleaning or power interruptions. Aqueon Quietflow was the very first brand of hang on back filter we ever used, the design seemed to be nice the presentation very professional and the price was very right so we went for it. For the few weeks everything was great so much so that I went ahead and added a second Quietflow 75 to the 60 gallon tank. With dual filters running my tank looked good and my fish were doing excellent. Fast forward a few weeks and the tank water quality started to decline so I replaced the filter cartridges and we were back in business. Upon doing some research and watching some videos online I figured out that it was possible to customize the filter media inside the Quietflow filters quite easily so that’s what I ended up doing. Overall I really like those filters but the only problem is when the inlet tube pops off and your impeller stops working. Maybe it was the way I used the filters but when removing them for cleaning and service the inlet tube (where the motor is located in the filter pump) always came off. This area seems to snap in place but never seemed to work quite right for me. Another downside to this filter is that it is a little noisey, not to the point where it is loud but if you are silent in a room the filter will provide a soundtrack. All in all I really like the design of this filter it gets the job done and is probably one of the only filters period that can self start. You don’t even need to prime it by adding water. Due to the powerful pump that gets submerged into the tank the filter will fill itself and begin functioning all on auto pilot. Certified flow rate of 350GPH, perfect for all aquariums up to 70-gallon, uses two Rite-Size C" filter cartridges"
In line with what we’ve mentioned earlier putting this filter in your aquarium you’ll cover all facets of filtration biological, chemical and mechanical. No matter your tank size there are various options to cover everything from 20 gallon to 70 gallon tanks. 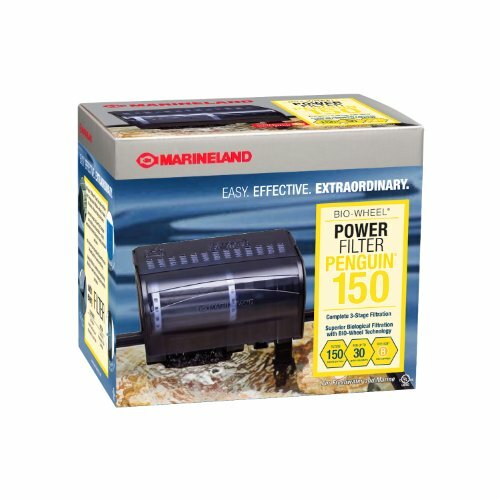 From our personal experience the Marineland power filter was so so and it receives this rating for a few reasons. 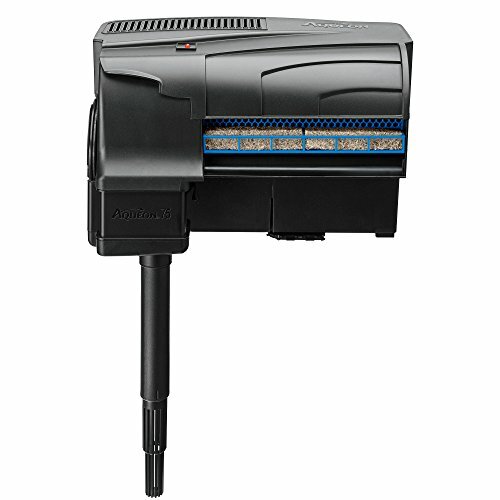 The first one is it is cartridge driven, while cartridge driven aquarium filters are convenient they can also be high maintenance. Typically a filter cartridge will last about 1 month and that’s 2 cartridges per filter. So for 1 years worth of filtration you’re looking at around $80 per year in replacements. So the initial filter might cost less than the Fluval and Aquaclear but with the disposable media factored into the equation the Marineland fish tank filter could come out being more expensive. Number three on our list and our personal favorite fish tank filter is the Aquaclear 110 filter, we’ve run just about every filter on this list and the Aquaclear is the actual filters we run on our tanks now. The Flowerhornlove way to filter an aquarium to above and beyond to achieve the best possible aquarium conditions. 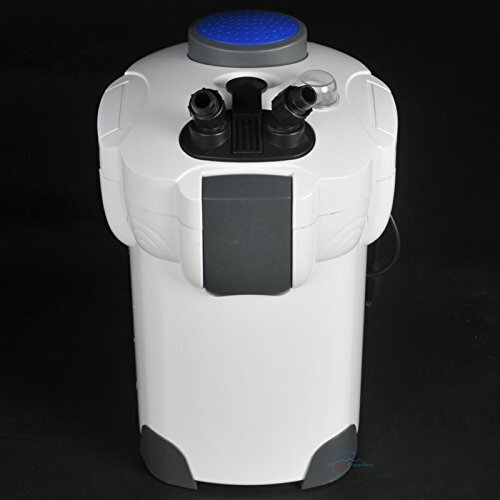 Why we like the Aquaclear is simple it provides a filtration volume of seven times more than any comparable filter. In layman’s terms the filter media area is more robust and provides more surface area for filtration. An example is in the Bio wheel filter there is basically only room for the filter cartridges but in the aquaclear there is preset customizable media basket. This basket helps provide three layers of filtration bottom, middle and top. In the lower filter level the aquaclear sponge traps debris while the porous nature of the sponge allows beneficial bacteria to flourish. In the middle layer additives like activated carbon or the Aquaclear ammonia remover serve as chemical filters to remove impurities and unwanted odors. As a result your aquarium will be crystal clear and odorless. Lastly in the top layer adding ceramic biomax rings will allow for beneficial bacteria to thrive and do what they do remove harmful ammonia and nitrite. Overall this filter is pretty quiet when in my office I have two aquaclear 110’s running on a 60 gallon aquarium and they are barely noticeable. With routine cleaning about once every two months and a proper setup these filters do very well in all aspects of filtration, mechanical, biological and chemical. These are our most desireable HOB or hang on back filters. Another great tip is truly customizing your hang on back filter with custom media trays from InTank, a media tray like this will allow you to add a canister like process to your HOB and even declutter your tank by adding allowing for your heaters to fit in the tray. Next we are going to get into the canister filters and tell you about our top picks and also give you warning that you must listen too! Hang on the back filters are perfect for beginner hobbyist but for larger fish tanks and aquariums canister filters are the way to go. The major difference is where the tank is situated a hang on back filter does exactly that it hangs on the back of your tank whereas a canister filter sits outside of you aquarium. Another difference that serves as a advantage is that a canister filtration system will have much more room for filter media and a large area for biological filtration to occur basically the whole bucket is a farm for beneficial bacteria to live and thrive. Some Canister filters even come with UV clarifiers to keep unwanted algae at bay and maintain pristine clear water. Now everything about the canister filter can’t be an advantage, there are drawbacks to consider. For starters the canister will require more work to go up and running, there will great media costs because you will need to stock the canister appropriately. Lastly they are much more expensive, while the most expensive hang on back filter is the Aquaclear 110 (rated for 110 gallons) at around $70 the canister filters worth while start at $100 (and for this price point are rated at 50 gallons). Before we rate the best canister filters for your fish tank we are going to issue the warning mentioned a little bit earlier. ONE OF THE MOST IMPORTANT THINGS TO REALIZE WITH CANISTER FILTERS IS THAT THERE IS A LOT MORE ROOM FOR USER ERROR. We say this to tell a story about a time when my Buttikoferi were courting each other for breeding, if you are familiar with the species these guys get quite aggressive. During a session of chase down they hit the inlet tube on a SUN SUN canister filter causing it to come loose and flood my bedroom :-(. After thousands of dollars in water damage I say all of this to warn you all of the extra room for user error and in this case room for accidents with canister filters be careful or use Fluval as their filters have incredible fittings that can’t be compromised by fish inside of the tank. Hydor makes their filters for fish tanks ranging from 20 to 150 gallons, the version we are rating in this article is the Hydor 350 which is rated for 60 to 100 gallon aquariums. First we will say what we like about this filter and that is the sizing of the canister it is more than sufficient measuring at 18” x 10” x 8.5”, it has everything one would need to set it up right out of the box. From our experience it’s always nice to add a few extra things to your filter if you are setting it up for the first time. Think of including extra filter floss as this will help trap debris and make your water clearer and second adding Seachem purigen is also a good option, Purigen works hard to polish aquarium water and regulate ammonia levels. 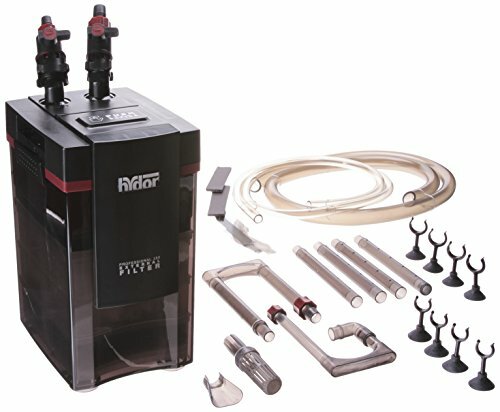 The Hydor 350 filter is very quiet and is virtually silent when tucked into a cabinet. If you intend to keep your filter out in the open you might have some noise but nothing to be too concerned about. Overall you get a solid filter that your fish will appreciate however in 2018 the Hydor wouldn’t be my pick it is the classic canister filter and nothing more nothing less solid performance but older styling make it a good option but not the best option. Now the Cascade series is one of the only filters that we’ve personally never tried. We used to see them all the time at the local Pet Club store, they were always reasonably priced and sometimes even on sale yet I never bit. Thinking as to why, I really don’t know but I think it might have something to do with the big bright blue canister or the packaging design either way it seemed a little cheap to me so I wouldn’t risk hundreds of dollars of fish and thousands of dollars of water damage on it. To the contrary though it seems that everyone who has given the cascade filters a chance love them. Let’s get into the specs, Cascade 1000 is rated for aquariums up to 100 gallons and features a standard 3 layer filtration process. Including inside the canister are 3 completely customizable media trays perfect for building out your own filtration set up. Another feature that is nice is the push start primer, having to pull on little tabs to prime a canister filter isn’t ideal it can make your hand cramp up in no time (yes i’m referencing you Fluval) but the button style primer is easy and hassle free. Overall Cascade users seem to think it is relatively quite and they enjoy the convenience of the flow valves, these valves allow a user to disconnect the filter from the hoses inside the aquarium for easy cleaning and maintenance. Even though we’ve never own one many people do and love them. What is more Cascade has more recently released the elite series filters which come with a tinted black canister maybe we’ll grab one soon for an in depth review. Tons of people seem to love Sunsun filters we aren’t fans, if you’ve actually read this far then you’ve read the part about my flooded bedroom. That tank was running a Sunsun filter, just the lack of innovation on these filters is what keeps me away from them. Sure everything works just fine, the filter runs quietly and filters the water well enough but make sure you check your hoses every week and buy extra clamps to secure them. Really who has time for that, this is the real world and we like products that make life more convenient. So nothing else to say on these filters, you can get them at great deals with lots of features like UV clarifiers and all the bells and whistles but we aren’t buying them anymore. But that shouldn’t deter you from getting one many customers have had great experiences with these filters and have beautiful healthy aquariums. The external fish tank filters by Fluval top our filter performance list for quite a few reasons. First off this filter is available for a wide variety of different aquarium sizes. It doesn’t matter if you have a 15 gallon or 100 gallon they have filter in this series for you fish tank. Starting with the 106 all the way to the 406 the same design and engineering is used. 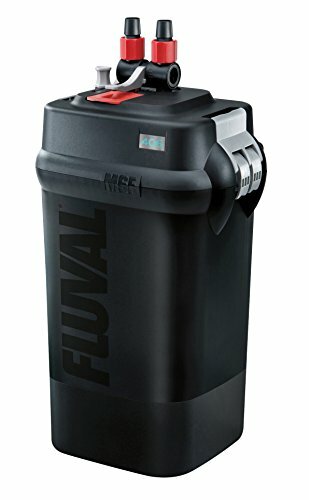 What you can expect is multi-layer filtration through 3 different levels, quiet operation with a dampened impeller and finally peace of mind and safety with the unique to Fluval aquastop valve. What we really like about this series of filters is the ease of set up but also the thoughtfulness of the design. In comparison with some of the other filters on the market everything seems to be superior on the Fluval from the fittings and seals down to the way you kick start the filter. Really the only negative is that we did have a Fluval 306 filter on a 60 gallon aquarium that didn’t want to restart after a routine maintenance. After calling them answering a few symptoms they (meaning Fluval) quickly helped us solve our problem and we were happy with their level of customer service. Remember fishkeeping isn’t a one month deal unless you’ve had some bad experiences and you need to get out but it’s almost a lifelong hobby invest in good equipment. Fluval Canister Filters an AquaClear hang on back filters are our top choices for all aquarium hobbyists. This is also a really good filter for cichlid tanks. There are other types of aquarium filtration systems out there some of which have fallen by the wayside and still others that are alive and flourishing. were super popular in the late 80’s and 90’s and we are up for leaving them there. While their purpose to cultivate a beneficial bacteria colony in the gravel and force water through this area is very effective it can be a real pain to clean. Once dirty you have to remove the layer of gravel from the aquarium, pull out the grates clean then and then reposition everything. Sounds like a ton of work, if you have a smaller sized tank and want to run undergravel filtration along your main filtration system feel free. However solely relying on an undergravel system isn’t recommended. Are often seen in local fish stores as the sole filtration system for an aquarium. But can a hobbyist rely on a [easyazon_link identifier=”B00GOFPX9I” locale=”US” tag=”flowerhorn0b-20″]sponge filter[/easyazon_link]? First think about the circumstances in the fish store. The fish store has the goal of bringing in fish and moving them into new homes, everyday if possible. Fish stores are also in the business of fish so when in the business fish keeping is your full time job. Water changes and aquarium cleaning are part of the daily routine but with the typical hobbyist there is work and family obligations where these things get pushed to the side. Because of these reasons a sole sponge filter isn’t enough filtration for a tank. [easyazon_image align=”left” height=”160″ identifier=”B01C8PH0OI” locale=”US” src=”https://images-na.ssl-images-amazon.com/images/I/41lftUnQC%2BL._SL160_.jpg” tag=”flowerhorn0b-20″ width=”160″] are interesting, they have chambers where the aquarium water is brought through at a fast rate designed to trap debris and filter out harmful substances. While we wouldn’t suggest relying on these types of filters for your main filtration solution they do serve as great supplemental additions. We’ve run the Marineland Magnum polishing internal canister filter and it did do a good job polishing the water but it didn’t serve the purpose that I needed so I returned it. What I didn’t like was how much tank space it took up. Other viable options like hang on back filters and canisters even more so take up less tank space and do a better job. How Much Filtration do I Need in my Tank? Any filter you buy has a rating and model number that corresponds with how much aquarium gallonage it can handle. But we wouldn’t recommend basing your filtration decisions solely on these suggestions. You really need to take into consideration how populated your fish tank is, if you are keeping one or two fish in a 55 gallon tank you might be able to get by with an Aquaclear 70 but if you have the same tank with 3 or 4 messy fish like Oscars for example you’ll probably be better off running two Aquaclear 110’s and a Fluval 406 canister filter. (I’ve actually done this before, great set up) To be successful and have no issues with ammonia and nitrite spikes our rule of thumb is double the recommended filtration from manufacturer and stay consistent with filter maintenance. So What is The Best Filter For My Fish Tank? Simply it all depends on your specific set of circumstances, if you are a beginner and don’t a tank with a heavy bioload your best option is probably a hang on back filter that can move 4 times your aquariums water in gallons per hour. For example if you have a 50 gallon tank you will want a filter that can move at least 200 gallons per hour. You can easily find this specification on the box of most filters and in product descriptions listed as “GPH” gallons per hour. 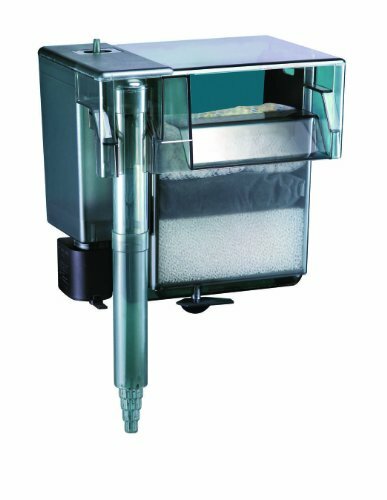 For serious fish keepers with large messy fish you might opt for double the filtration recommended by the manufacturer in a canister filter. One of the standout filtration systems that would meet these requirements even on larger tanks is the Fluval FX6 canister filter. For smaller tanks 10 gallons and under you can opt for really any style of filter. You can go with a sponge, hang on back or internal. Our choice would be something like an internal filter or a sponge. 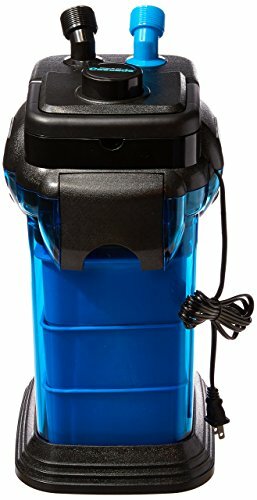 A 20 gallon is an interesting size and is really perfect for a hang on back filter but many companies do offer entry level canister filters at the 20 gallon range. 30 gallon fish tanks are pretty much in the same boat as the 20 gallon probably small enough for a hang on back to get the job done maybe perfect for two of them but a canister filter is a solid option for someone keeping messy fish like cichlids. For 40 gallon aquariums a canister filter is perfect, opting to go with any of the Fluval external filters is going to be a good choice. Keeping up with our trend of over filtering we’d probably suggest the Fluval F306. On a 55 Gallon aquarium the same logic applies as on the 40 gallon, keep the filtration heavy and mix in multiple types of filtration if necessary. For larger aquariums you want to make sure that you have adequate filtration and really more than adequate. Large fish tanks are hard to clean so you want to make sure you limit the amount of time you have to spend cleaning by having a good filter system and staying on top of maintaining your filters. We’d suggest the Fluval Fx6 this filter is capable of handling up to 400 gallons. So in review it makes sense to opt for at least double the recommended filtration, mix and match the types of filtration you run to make sure you are getting good mechanical filtration, chemical filtration and biological filtration. There are lots of excellent filters on the market and there are lots of bad products out there too. Do your research and consider the reviews and guides like this one to make an educated purchase. Happy fish keeping!! !